I don't know where I found these, but they've been sitting in my clippings folder for a few months and rightfully burning a hole in my pocket! Australian Vogue, maybe? Hi Lakshmi here form celebrations.loving your blog.just tumbled onto your blog.nice colorful ideas. These clippings came from ELLE DECOR magazine... 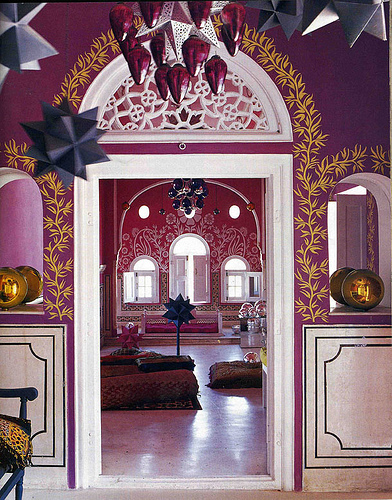 I clipped them as well..the rooms are just beautiful! They were taken in a home in India. ELLE DECOR - I have the same pics in my "inspiration" file. Was looking at de Guournay monochromatic handpainted wallpaper for ideas, but felt too formal for my house. 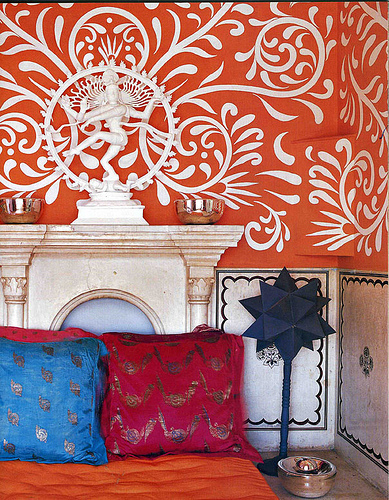 These exuberant white/pastel hand-painted Indian motifs on bright walls made my heart sing!